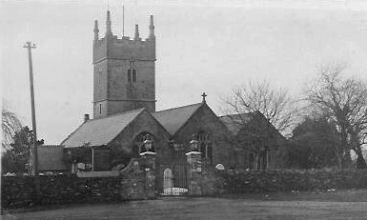 It was not until 1898 that the Ancient Parish Church of Saint Budeaux, with much of its parish, was taken within the Borough of Devonport courtesy of the Devonport (Extension) Order of that year. A place of worship is said to have existed beside Ernesettle Creek since around 480AD, when Bishop Budoc, the Bishop of Dol, in Brittany, sent some of his monks to convert the Anglo-Saxon settlers in Devon to Christianity. Although they set up a church on the shore of the Creek, it was considered to be within the parish of Saint Andrew's at Plymouth, and was served by either the clergy of Saint Andrew's or monks from Plympton Priory. But in 1482 Mr John Ernesettle, the Lord of the Manor, and twenty-three of the local residents petitioned the Bishop of Exeter to be granted the rights of baptism and burial as the journey to the main church in Plymouth was long and hazardous. This Bishop Courtenay granted on May 20th 1482 on condition that they built a residence for the priest and created a piece of land that could be consecrated for burials. Thus Saint Budeaux became an ecclesiastical parish. The Church itself was probably quite small although it was recorded as having a tower with three bells when Commissioners appointed by King Edward VI carried out an inventory of church property in 1553. Bishop Courtenay laid down that the new congregation should pay four pence a year to the Prior of Plympton and a further forty shillings a year to the vicar of Saint Andrew's Church, Plymouth, to recompense them for the loss of income from burials. Services in the church would have been according to the Roman Catholic traditions until the Church of England was founded. The present building dates from around 1563, after it was decided to move the Church to higher ground, away from the river. It became a focal point during the Civil War battles in the area and had to be restored in 1655. A Parish Poor House was erected about that time. The Church was restored again in 1876. The parish registers are held by the Plymouth and West Devon Record Office at Clare Place, Coxside, Plymouth, PL4 0JW.